So we’ve run both cameras pretty much all day, every day. Our camera department budget, and most alarmingly our film stock budget, has doubled. With my producer-hat on I had to explain this to our financiers, but when they saw just some of those sunsets they seemed happy… No that’s a lie. Not happy. They just didn’t shut us down. “They seem happy! Let’s move on…” is just what I told anyone who asked about it. Today I get to muck around a bit though, getting some stuff of Burke dropping little pebbles in a rock pool contemplatively – only to have Robertson drop a boulder into it from behind him. In doing his shock response Tom makes the most hilarious roaring noise – once again proving his comic genius. These scenes are nearer the end than the beginning of the journey and over the next few days we will shoot some of the saddest, as the shoot draws towards a close. But tonight we film a firework display and the comedy of the camp catching fire. It’s a long night. The hours I spent in the script wondering how we will manage to shoot this mishap are about to be answered. By midnight it’s freezing and as we pack up for the day and hurry to warm cottages, I’m aware that the gracious welcome of this coast may be about to run out. This entry was posted on February 17, 2012 by mug7. 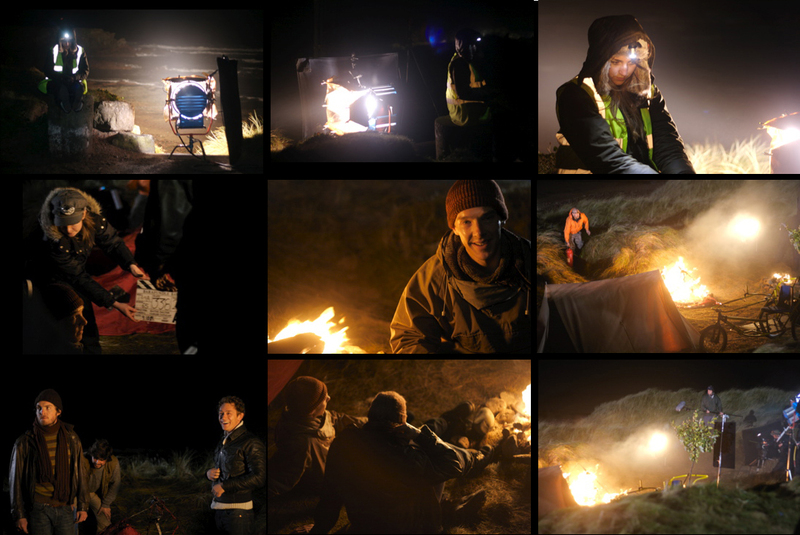 It was filed under Uncategorized and was tagged with 28 Sunsets, Actor, Adam Robertson, B Crew, Barafundle Bay, Beach, Benedict Cumberbatch, Cast, comic genius, Crew, Davy, Filming, Fireworks, freshwater west, JJ Feild, Magic Hour, Movie, Mug 7, Pembrokeshire, Production Diary, rock pool, Shoot, stunt, Third Star, Tom Burke, Vaughan Sivell, Wales, warm weather, Weather. Reblogged this on Cumberbatch infobank.